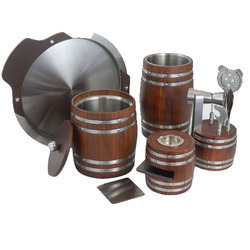 Whether you’re a professional bartender or a home mixologist, our selection of bartending kits will definitely interest you. From drink-specific kits that make great gifts to essential bartending mixing kits, we’ve got it all. After shaking or stirring a cocktail, you need to separate it from the ice you used to dilute and chill your drink. That's where a cocktail strainer comes into play. 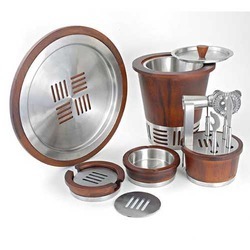 Like any good hawthorne-style cocktail strainer, this teak wood and stainless steel number from the bar tool experts at Viski fits snugly over the mouth of mixing glasses and cocktail shakers. The strainer acts like a barrier, holding back the ice (and any fruit or herbs you may have used) as you pour you cocktail into a serving glass. 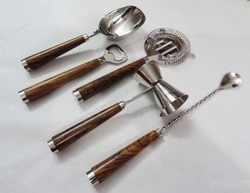 Its handle is made from stained and polished teak wood. It features a a modern stainless steel design and removable spring filter, which makes cleaning a breeze. Just be sure to wash it by hand. 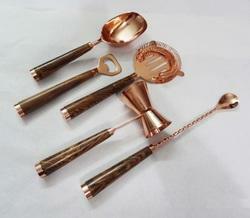 We are offering Wood Steel Bar Set to our clients. 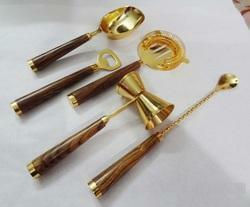 We are offering Teak Wood Steel Bar Set to our clients. 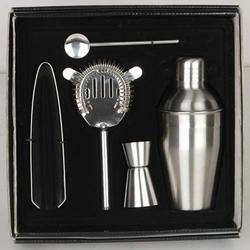 We are offering Bar Set with Gift Box to our clients. Looking for Bar Tool Sets ?